I switched to freelancing earlier this year so I had to get my own insurance. I'm really glad that insurance companies can no longer deny you coverage due to pre-existing conditions thanks to Obamacare. However, the premiums are still quite high and I decided to go with a cheaper plan, the "Bronze Tier", which has a high deductible. The plan I chose also only covers 50% of the cost of drugs/medical supplies. For us diabetics, we all know how expensive diabetes supplies can be. Just the test strips, for example, the quote I got from my pharmacy priced them at almost $1 per test strip. Since we normally test 3-4 times a day, that alone could easily cost us $90-$120 per month. In my case, even when the insurance kicks in (after the deductible), I'd still pay $0.50 per test strip. So I decided to check out Amazon.com, knowing that they're very competitive with their pricing. 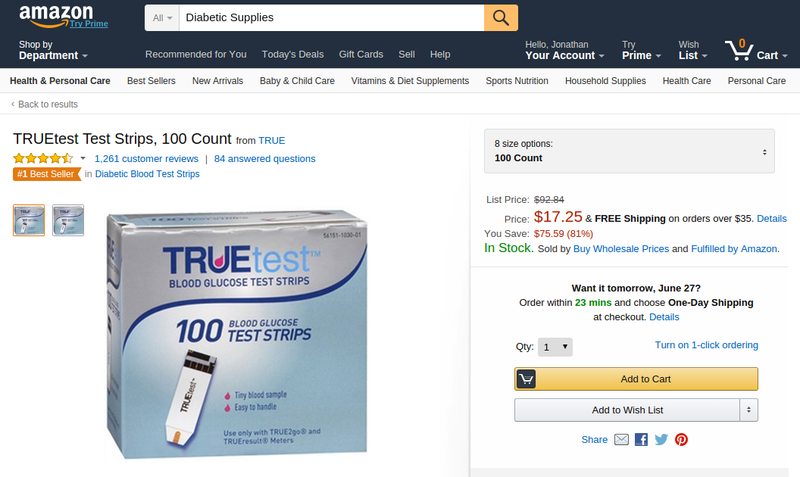 I was surprised to see test strips, like this one, at less that $0.18 each. It actually makes more sense for me to just buy from Amazon and pay out-of-pocket. You can also buy meters, pen needles, and lancets from there. The only thing we can't buy (yet) is insulin. It makes me wonder sometimes if people purchase supplies from their pharmacy using their insurance and then resell them at a lower price on Amazon. Since Amazon and its seller community are very competitive with their pricing, it's quite common to see prices fluctuate a few times a day. I built an app that actually allows you to track a product's price and set a price alert. I called it EZ Price Alerts. The app also displays a product's price history to give you a better idea on what to set your target price to. 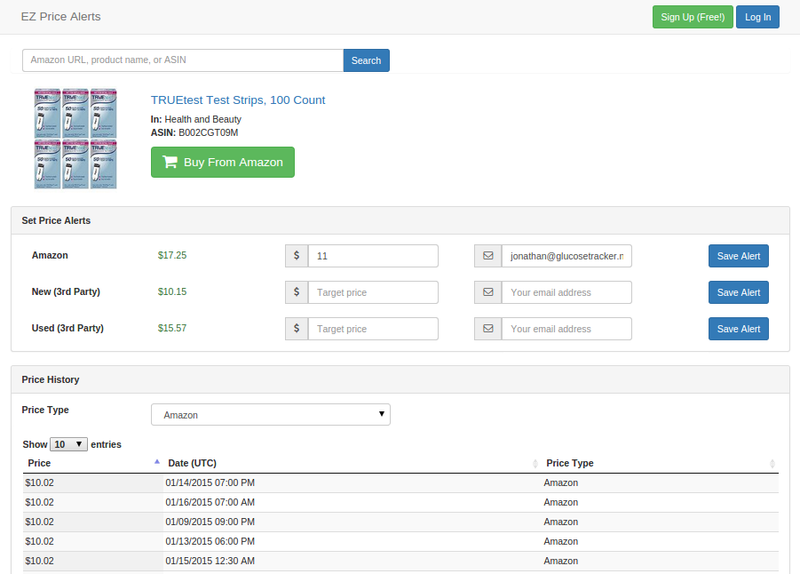 Let's look at this product, TRUEtest Test Strips, as an example. The current price is at $17.25, but if you look at the price history table and sort it by price, you can see that it had gone as low as $10.02. 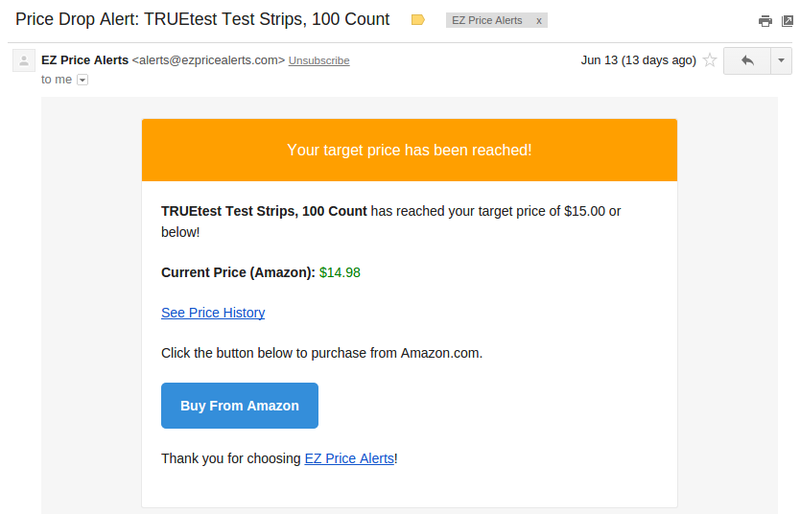 If you don't need test strips anytime soon, perhaps you might want to create a price alert at $11 so you can get notified by email if the price drops to $11 or below. I hope this tip helps others save some money on their diabetes supplies. Please feel free to leave a comment below if you have additional tips!